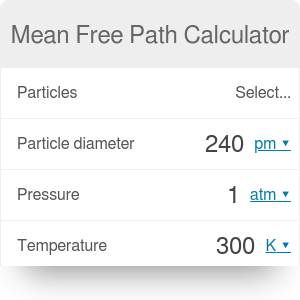 This mean free path calculator will help you calculate the mean free path of a particle with the specific diameter in an ideal gas. An ideal gas consists of a large number of particles (atoms or molecules) which are in constant rapid motion and can collide with each other. During these perfectly elastic collisions, particles can change their directions or energies. The mean free path is the average distance that a particle travels in a material medium, between successive collisions with particles of that medium. The term "mean free path" is used in many areas of physics. Do you want to learn how to calculate the mean free path? In the following text, you will find a more detailed mean free path definition and the mean free path formula. Use our calculator to estimate the average distance between particles' collisions of every ideal gas you want. All you need is to provide the ideal gas parameters (pressure and temperature) and an effective particle diameter to the mean free path equation. At the end of this text, you can find a table with the atomic radii of some elements. If you want to analyze properties of real gases, don't hesitate and check out our van der Waals equation calculator! In gases, particles have full freedom of movement - there are no chemical bonds between them. All of them are in constant motion in the space occupied by the gas and never stop in one place. There are virtually no long-range interactions between molecules, and the existing ones are very weak. The only way in which particles can interact are collisions between them. Moreover, if the gas is placed in a container, its particles constantly collide with the walls of the container, exerting specific and constant pressure on them. Have you ever wondered how fast do particles move in gases? Check it out using our particles velocity calculator! also nuclear physics, optics, astronomy or acoustics. k is the Boltzmann constant k = 1.380649 * 10^(−23) J / K.
In fact, the diameter of a particle is not well defined, because gas particles do not behave like hard spheres. We use only the effective diameter of the atom which is the minimum distance at which two particles of the same gas are approaching each other during a collision. In other words, it is the distance between the centers of these particles at the moment of collision. The mean free path of gas molecules is often used to measure the quality of the vacuum. For example, the mean free path of air particles at room temperature and atmospheric pressure 1013 hPa equals 68 nm. However, if we decrease pressure to high vacuum ~10^(-5) Pa, the mean free path is approximately 1 km. Our mean free path formula requires atomic diameter to perform proper calculations. You can find both radii and diameters (two times radius) of the atoms of some gases in the below table (expressed in picometers - pm). A. Bondi in 1964 in van der Waals Volumes and Radii. M. Mantina, A. C. Chamberlin, R. Valero, C. J. Cramer and D. G. Truhlar in 2009 in Consistent van der Waals Radii for the Whole Main Group. Mean Free Path Calculator can be embedded on your website to enrich the content you wrote and make it easier for your visitors to understand your message.